This overview of Joanna Macy's innovative work combines deep ecology, general systems theory, and the Buddha's teachings on interdependent co-arising. A blueprint for social change, World as Lover, World as Self shows how we can reverse the destructive attitudes that threaten our world, with concrete suggestions on how to address "An Inconvenient Truth". 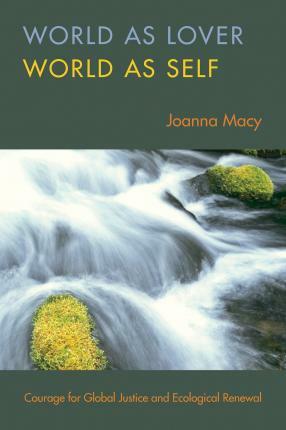 Eco-philosopher Joanna Macy, Ph.D., is one of the best know spiritual activist in this country. She is a scholar of Buddhism, general systems theory, and deep ecology. A respected voice in movements for peace, justice, and ecology, she interweaves her scholarship with four decades of activism. Her wide-ranging work addresses psychological and spiritual issues of the nuclear age, the cultivation of ecological awareness, and the fruitful resonance between Buddhist thought and contemporary science. Her group methods have been adopted and adapted widely in classrooms, churches, and grassroots organizing. Her work helps people transform despair and apathy, in the face of overwhelming social and ecological crises, into constructive, collaborative action. The author of 10 previous books Mrs. Macy travels widely giving lectures, workshops, and trainings in the Americas, Europe, Asia, and Australia. She lives in Berkeley, California.